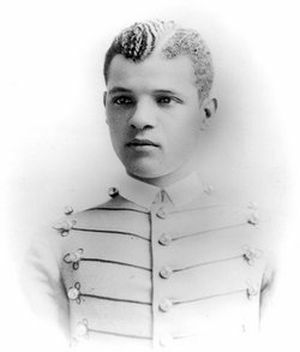 John Hanks Alexander is best known as the second African American to graduate from the United States Military Academy at West Point after Henry Ossian Flipper. Alexander was born on January 6, 1864 in Helena, Arkansas, to James and Fannie Alexander, who were both born as slaves in Virginia, and had six other siblings. In 1849, while still a slave, John’s father began working as a prominent barber who attracted many customers in Helena, Arkansas. His success allowed him to purchase freedom for himself and his family along with property. Young Alexander attended high school in Helena where he ranked the best in his class. After graduation he enrolled in Oberlin College in 1881 at the age of 17 after teaching in Carrollton, Mississippi earlier that year. During his time at Oberlin Alexander continued to excel in his studies and attracted compliments from professors. While at Oberlin, he decided to attend West Point partly because of his knowledge of Henry Flipper’s years there. He was endorsed by Democratic Congressman George W. Geddes of Ohio who promised to appoint whoever scored the highest on the admission exam from his district regardless of race. Nineteen-year-old Alexander had the best score and entered West Point in 1883 as the last of the 120 cadets accepted. While at West Point Alexander was respected by his fellow cadets due to his intellect. Nonetheless, he could not escape the racial discrimination common for that time and was socially ostracized by these same cadets just as Flipper had been earlier. Despite these challenges, Alexander excelled academically and at one point was fourth in his class in English and seventh in French. In 1887, Alexander graduated from West Point with the title Second Lieutenant and a class ranking of 32 out of 64. After graduation, Alexander was stationed with the Ninth Cavalry, a Buffalo Soldier regiment, at Fort Robinson, Nebraska. At the time of his posting he was the only black officer in the United States Army commissioned to lead troops in combat. At Fort Robinson his duties mostly revolved around patrolling nearby Indian reservations. In 1890 he was transferred to Fort Washakie, Wyoming, where his duties included escorting prisoners and supervising construction projects. In early 1894 Alexander was assigned to Wilberforce University, an African American institution in Xenia, Ohio, as a professor to teach military science and tactics. This appointment was popular in the black community because it was the first of its kind in the history of the U.S. On March 26, 1894, Alexander died at age 30 due to apoplexy and was buried near Wilberforce University with full military honors. He was later honored by the U.S. Department of War when Camp Alexander in Newport News, Virginia, was named after him in 1918. Willard B. Gatewood, "John Hanks Alexander of Arkansas: Second Black Graduate of West Point," The Arkansas Historical Quarterly, 103-128 (1982); Krewasky A. Salter, "John Hanks Alexander," The Story of Black Military Officers, 1861-1948 (New York: Routledge, 2014). Military Officers, 1861-1948 (New York: Routledge, 2014).